Street art isn’t rare in Prague — saints line Charles Bridge and disappearing men from the Memorial to the Victims of Communism stand near the foot of Petřín Hill. Just about every náměstí (square) in the city has a statue. Though the head of the post office in Prague rejected this as a decoration there, this polystyrene and epoxy resin “sculpture” now adorns in mall off Wencelas Square in Prague. 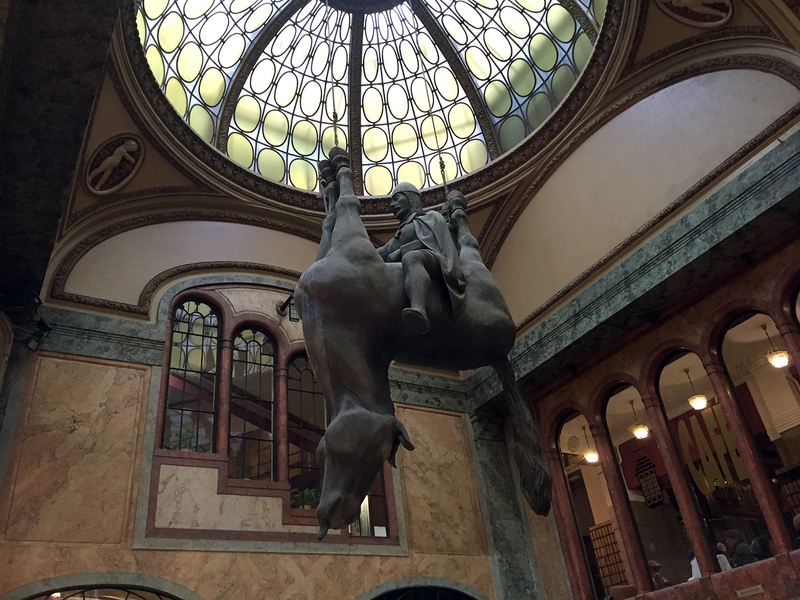 His statue of King Wenceslas astride his upside down dead horse was first created in 1999 for the newly opened hall of the Prague Post Office on Jindřišská Street. But, as Černý’s website explains, the post office director said it was “‘way too much,’ without specifying what was too much.” It now hangs in the Lucerna shopping mall in Prague. It definitely doesn’t look like the statue of Wencelas at the top of the square bearing his name. His “Piss” statue, permanently displayed outside the Kafka Museum, probably makes more sense in the video form from his website than my attention-grabbing still photo at the top of the page. (Scroll down on that link — it’s from 2004.) That site reports the men “write” messages in the Czech-shaped pool where they stand, sent to them from bystanders. I’ve never seen the mobile phone number to text to make that happen. That’s not in my AT&T plan, but I would be willing to get an overage charge if I could do it. And then there are the babies. First designed to decorate the The Žižkov Television Tower, a Communist-era structure many say is the ugliest place in Prague, these 10 giant sculptures made of fiberglass crawl up the tower, visible from all across the city. 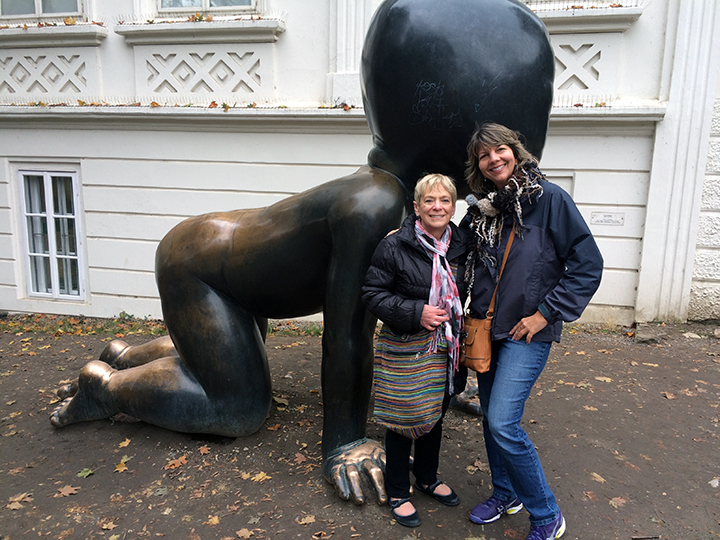 Their three identical cousins in Kampa Park are bronze. All have non-faces that look a bit like bar codes. Other notable art around the city include “In Utero,” a giant pregnant woman, who looks like she’s made out of shiny, silver Legos, Sigmund Freud “Hanging Out” from a pole high above a small cobblestone street in Old Town, and a 45-ton stainless steel Kafka that turns much like the statue in Charlotte, sitting outside the downtown Tesco. Wendy Wallace helps demonstrate the scale of In Utero. Freud has hung by one hand in several sites. Kafka is 10 meters tall and its 42 layers rotate at 6 mph. Of course that’s not all. 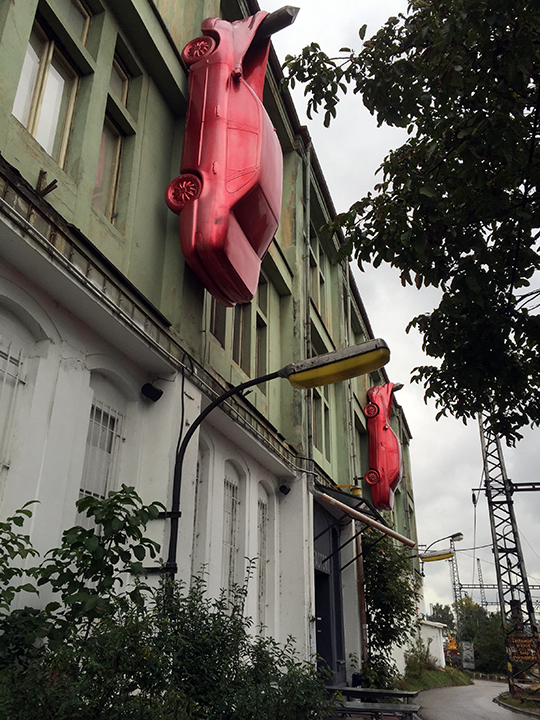 Černý’s Meet Factory, described on its website as “a place for live art, music, theatre, residency, gallery, workshops and more…,” includes a white room with a Clorox bottle that periodically erupts with confetti and a row of about 20 twin-sized mattresses, lined up on their ends with a three-foot-in-diameter hole through them all. When we visited — two tram rides and a trek behind the railroad yard — they were also producing an Indian clothing commercial. “It’s hard to find a red bathroom where you can shoot video,” one of the crew explained. This entry was posted in Uncategorized by Candace Perkins Bowen. Bookmark the permalink. Truly unique! Thanks for bringing Cerny’s (I don’t think I have the keys I need to get this right.) creativity to all of us. Hope my niece who lived in Charlotte for several years got to experience his work there. As always, your blog is entertaining and filled with super photos! Neither did I until I investigated! Thanks for posting this. It has answered a few questions I had. Really enjoyed my visit with you and Skip. Enjoyed having you here — and had to do a little research for this post!